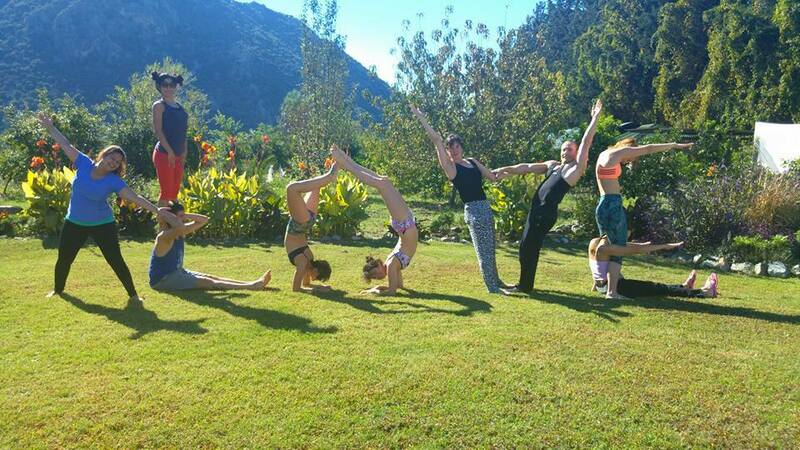 The most uplifting and nourishing Yoga Holiday! We are heading to beautiful Southern Turkey to provide all you need for inner harmony, relaxation, the luscious rush of feel-good hormones – and of course a wide range of spine-tinglingly blissful nature, fun, connection, immense creativity and social time. All created : to see your asanas blossom! All levels are welcome with space to expand ones yoga and play-shop anything specifically requested! Balance for everyone paid by 6 weeks before holiday start date. You will be lead to great physical posture and confidence to embrace to world as your own. The whole art of handstands provides perfect fitness. In the back bending, or opening the front of the body workshops you shall find great happiness, ease and a transforming consciousness. Backbends are magical. Backbends are transforming and handstands are about creating the life you love. The morning sessions will be general yoga classes, a great start to your day. In the afternoon, you shall focus on handstands, backbends and Acro. In the handstand workshops, everyone shall find a place to be comfortable in some handstand variation and everyone shall find that they expand their abilities. Beginners will be encouraged to find their first handstand, and all will experience the various ways to enter a handstand from kicking to the various pressing up ways (such as straddling, tucking up or pressing up), to finding movement within a handstand to learning the steps to one arm handstand. You shall experience optimum handstand alignment, with partners and solo. You shall warm up the body, strengthen the abs and back muscles, open the shoulders and experience alignment in plank and in many handstand variations. Adriana’a Ashtanga and Rocket sessions topped with some insertions on backbends, hands-on adjustment and yin. Yin facilitates regaining our energy flow, stamina and skyrockets our flexibility in the hips, pelvis, inner thighs, lower spine. These areas are especially rich in connective tissues. World renowned yogi, Catie is the author of “This Is It, Enlightenment with CYoga and teaches master classes internationally. Catie shares a core approach that anything is possible. She is spontaneous with a highly original and integrated approach to yoga. Her dynamic energy connects with everyone, and she developed her own formless / form of yoga – Cyoga. Cyoga is this “Magic Moment of Involvement with Love/Yoga; brilliance in any situation. Catie would describe herself as an organic vegan yoga coach (trained yoga therapist). She is based in Chelsea, London. Catie has a complete freedom approach and conducts all types of classes including one-on-one and group yoga, master classes and yoga training intensives at some of the worlds most naturally beautiful locations including Turkish gulets on the Azure sea, Italian farmhouses, presenting at the red rocks of Sedonas yoga Festival; anywhere and everywhere. Many of the intensives she offers and co-creates with others are backbend and handstand focused. Backbends are transforming and handstands are about creating the life you love. She also has a strong hub of London yoga family, students and clients. Catie has studied many styles of yoga and handstands from the inside out and she is able to transform weaker areas in ones yoga practice to ones greatest strengths.